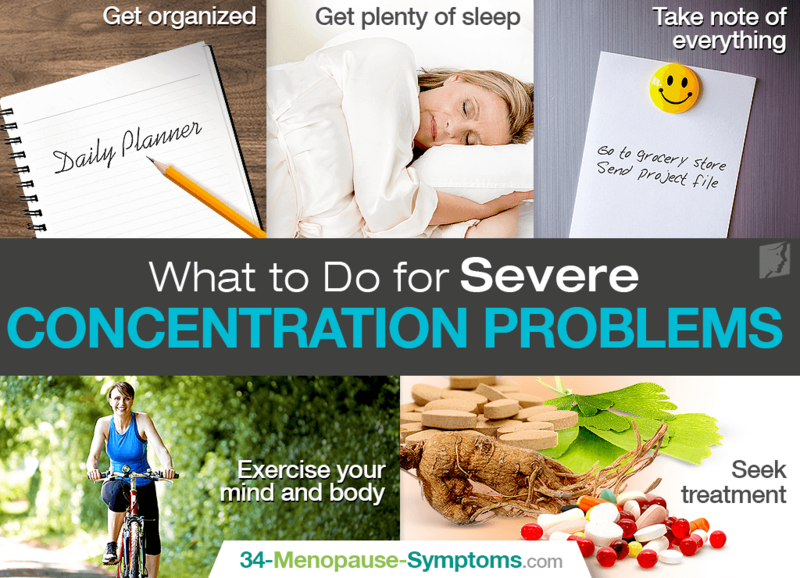 Severe Concentration Problems: What to Do? Severe lack of concentration can be symptom of a variety of health conditions. However, for women transitioning through menopause, hormonal imbalance is normally to blame for difficulty concentrating, also known as mental fog. Continue reading to discover what you can do to solve severe concentration problems and get rid of the concentration-destroying brain fog today. Although concentration problems are common among menopausal women, extreme severity calls for immediate medical attention. Rule out other causes before taking advantage of the following tips. Plan your day around the times when you feel most concentrated. If you notice you have difficulty concentrating in the morning, plan your most important feats in the afternoon, or vice versa. Also, try to stick to a routine and be structured to make remembering and getting started on tasks easier for you during bouts of severe concentration problems. Good sleep helps us think clearly, remember pertinent information, and make better decisions, thus feeding problem-solving abilities and high-level, innovative thinking. Therefore, it is imperative to get at least seven to eight hours of restful sleep each night. If a daytime nap is needed, keep it to less than an hour so as not to disrupt that night's sleep. In order to remember necessary tasks, record essential information. This could include phone numbers, appointments, important names and activities, etc. Do so manually in an agenda or calendar or electronically in a digital planner or recorder. To make things easier, keep your notes in one place, not scattered around. Research suggests that regular aerobic exercise positively affects verbal memory and learning. So, if you suffer from severe lack of concentration, be physically active for at least 30 minutes a day, five days a week. This will also release feel-good endorphins, giving you a heightened sense of well-being. Also, mind-body practices - like meditation and yoga - can beat the fog as well as brain exercises, which include riddles, puzzles, crosswords, and more. Even though there are numerous tips out there for you to manage mental fog, the best piece of advice we can offer you is to seek treatment to find the underlying cause. For menopausal women, this is most likely hormonal imbalance, and treatment for difficulty concentrating revolves around implementing lifestyle changes and alternative medicines, like hormone-regulating supplements. In sum, severe concentration problems can be dealt with by organizing, getting plenty of sleep, taking note of everything, and exercising your mind and body. However, it's always recommended to seek professional treatment for your specific case. Only then will you know what is causing your mental fog, and you will be able to take the appropriate measures. Rest assured that this cloudy stage in life does not have to last with proper management and treatment. Reading is relaxing and enjoyable. Keep reading to discover how reading could be the key to overcoming concentration problems.